At the Global Cli­mate Action Sum­mit one of the inter­est­ing events was a multi-​​university sum­mit on car­bon pric­ing. Yale Uni­ver­sity, Smith Col­lege, Swarth­more Col­lege, and both myself and Prof. Ann Carl­son from UCLA par­tic­i­pated in a dis­cus­sion about the chal­lenges and oppor­tu­ni­ties to price exter­nal­i­ties in uni­ver­sity actions. 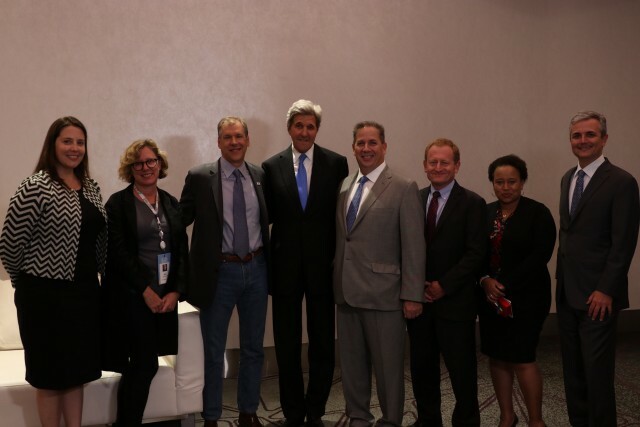 Cap­tion: Prof. Ann Carl­son (sec­ond from left), Dan Kam­men, (third from left), next to for­mer Sec­re­tary of State John Kerry, Kammen’s for­mer ‘boss’ when he served as Sci­ence Envoy, along with col­leagues from the World Bank, Smith Col­lege and Swarth­more College. On Sept. 13, the sum­mit hosts “Higher Edu­ca­tion Lead­er­ship on Car­bon Pric­ing,” an event focused on the expe­ri­ences of Yale and other schools in imple­ment­ing inter­nal car­bon pric­ing on cam­pus. For­mer U.S. Sec­re­tary of State John Kerry will speak at the event, which also will include Yale Car­bon Charge direc­tor Casey Pick­ett and Yale Asso­ciate Vice Pres­i­dent for Strat­egy and Ana­lyt­ics Tim Pavlis. At the event, rep­re­sen­ta­tives from Yale, Swarth­more Col­lege, the non­profit group Sec­ond Nature, and the Car­bon Pric­ing Lead­er­ship Coali­tion will unveil a Higher Edu­ca­tion Car­bon Pric­ing Toolkit. It is the most com­pre­hen­sive com­pi­la­tion of exist­ing tools for imple­ment­ing inter­nal car­bon pric­ing on col­lege and uni­ver­sity campuses. “When I share Yale’s approach to car­bon pric­ing, peo­ple often ask, ‘How does it work? What options are there for my insti­tu­tion to put a price on car­bon emis­sions?’ This toolkit begins to answer those ques­tions,” Pick­ett said. Car­bon pric­ing refers to the idea of plac­ing an extra charge on prod­ucts or ser­vices based on the amount of car­bon they emit. Hun­dreds of busi­nesses, pri­vate uni­ver­si­ties, and other insti­tu­tions — includ­ing Yale — now have some ver­sion of a car­bon pric­ing pro­gram in place. Yale has taken a lead­er­ship role in explor­ing dif­fer­ent approaches to car­bon pric­ing and shar­ing its find­ings. In 2017, Yale became the first uni­ver­sity to imple­ment a finan­cially impact­ful fee on car­bon emis­sions for more than 250 build­ings and 70% of car­bon diox­ide emis­sions on campus. The best prac­tices regard­ing car­bon pric­ing that Yale has accu­mu­lated are part of the new toolkit, which includes case stud­ies, com­mu­ni­ca­tion guides, and data man­age­ment tools. The Yale Car­bon Charge idea orig­i­nated with eco­nom­ics pro­fes­sor Bill Nord­haus, who devel­oped the “social cost of car­bon” con­cept, an esti­mate of the cost of global dam­ages from an addi­tional ton of car­bon diox­ide emit­ted. After Nord­haus sug­gested the value of hav­ing an inter­nal car­bon charge, a group of Yale stu­dents advanced the idea. Yale Pres­i­dent Peter Salovey orga­nized a Pres­i­den­tial Task Force to study the idea. The task force rec­om­mended test­ing a pilot project, which began in the fall of 2015.